Paragon has PDF files of most of their dropouts. You can get the dimensions from there. I've made my own front dropouts a few times. The axle end cap clearance is not critical, as it is just to help line up the axle for insertion. Too big is better than too small. As for the axle clearance and thread specs, they are not really critical either. The non threaded side just needs enough clearance for the axle to pass through easily. I just use a standard metric tap for the threaded side. (M15 x 1.5 in the case of my front dropouts). The only dimension that is somewhat critical is the thickness of the dropouts, so that the axle threads in fully and doesn't run out of thread before it gets tight. Last edited by dsaul; 03-01-19 at 03:18 PM. Your diagram seems to show slotted dropouts. However, I thought the through axles simply had a hole on the left and a threaded hole on the right. However, what I might consider is taking your existing rear dropouts and expanding the slots to fit the through axle. Then welding on caps on the outside for your through axle. Getting everything aligned perfectly might be a pain (including hole depth to the end of the axles) but you'd end up with a very strong joint with essentially both the slotted dropout PLUS the drilled and threaded through axle. Your cost would be some scrap metal, and essentially only labor, without any parts to buy. Also less to screw up with frame alignment. That's exactly the plan. The image witht he slotted dropouts in the intermediate before the two bushes are welded into place. I should be able to get then +-1mm or so by using the existing dropouts as a datum, but i'll test fit everything dry and do any fettling i need to make sure the wheel tracks nice and straight. Good point on the end cap clearance. I was expecting something like a H7f7 axle/hole tol, but the stated tol. on the paragon drawings is waaaay wider than i'd have expected. 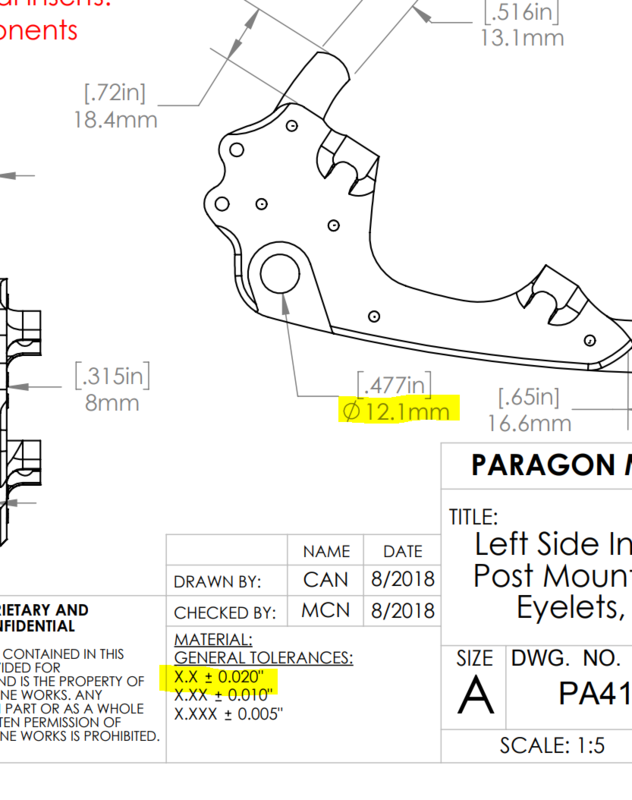 Would you read that as drawing tol, as 12.1mm+-0.02" or 12.1mm+-0.005"? It's not exactly clear whether the relevant drawing tol. class is called out by the decimal of the metric or imperial dim. so thats effectively either 12.1+-0.5mm or 12.1+-0.12mm. Either way, it's still fairly loosely controlled for what i'd consider a critical fit, but should be easily achievable without having to order a reamer. Anyway, I think I've got everything I need to i'll get the cups machined, axles ordered and report back once there's any progress, thanks for the help. I would read that as .005" tolerance. The metric numbers are only there for reference. They are machined to the imperial specs.